Experts said the equipment may help the SDF further diminish IS, which beefed up its urban defenses with car bombs, booby traps and other battlefield hazards. Al-Monitor first reported that the Pentagon was transferring equipment from Iraq to Syria in June. The equipment would be helpful, “particularly to be able to overcome entrenched [IS] defenses” and vehicle-born improvised explosive devices, which the militant group used extensively to slow US-backed forces in Syria’s Middle Euphrates River Valley, said Nick Heras, a Middle East fellow at the Center for a New American Security. Mazlum Kobane, the SDF’s top commander, said last week IS is just days away from losing control of all its territory in Syria. 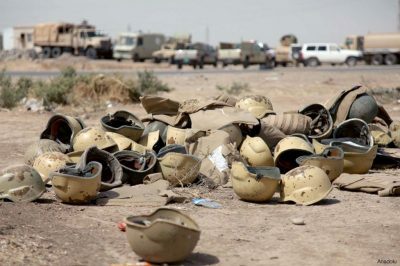 But the shift in resources may come at a cost for Iraq, which is struggling to regain its military footing even after declaring IS defeated in 2017. The Pentagon budgeted $800 million to rebuild the country’s armed forces last spring. But experts worry that without US boots on the ground in next-door Syria, Iraq could be forced to pick up the slack, taking on an expeditionary role fighting IS across the border. As Iraq looks to beef up its counterinsurgency operations against IS, and US forces take on more of a training mission, Ambassador Fareed Yasseen said the US troop and equipment presence in Iraq remains to be seen. The envoy’s assessment aligns with incoming US Central Command chief, Marine Gen. Kenneth McKenzie, who told Congress in December that Iraq will not be able to pay to maintain US equipment. Yasseen said Iraq will likely see an “internationalization of the Western military presence that’s there in support of Iraqi military capabilities.” That includes a new NATO training operation led by Canadian Gen. Dany Fortin. The US-led coalition fighting in Iraq told the Pentagon’s inspector general last month that training of Iraqi forces “is of a basic nature” and does not fit US definitions of counterinsurgency instruction. Though the president visited US troops at al-Asad air base in December, he did not meet with Iraqi officials.